Sonic Gorilla is coming*. And it is chest-beating its way onto campus and into the Arts Centre bringing unexpected sounds to unexpected places. Be transported on journeys to unique and special places. Watch out for an invasion of electronic lifeforms as they swarm playfully across campus or use a descent of woodpeckers to start your own performance of the Arts Centre building. If you are looking for some light relief, Sonic Gorilla also has a potty new way of passing the time and we won’t even ask you to spend a penny. Just beware the tempting bell as it calls for attention! 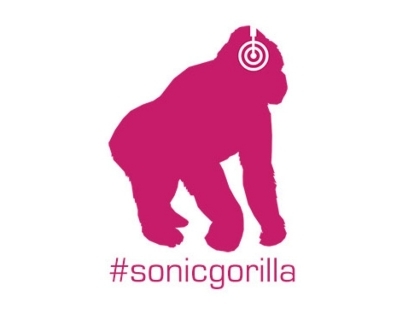 Our pink gorillas in headphones will be your guide as you explore the brand new audio discoveries on offer. Something to go ape for! All the works in Sonic Gorilla run throughout the day and are free to access and enjoy. *Disclaimer: please note that no actual gorillas have been involved in the making of Sonic Gorilla. Booking is required for Behind Closed Doors – to book a free place, call Box Office on 024 7652 4524 or email ticketing@warwick.ac.uk.